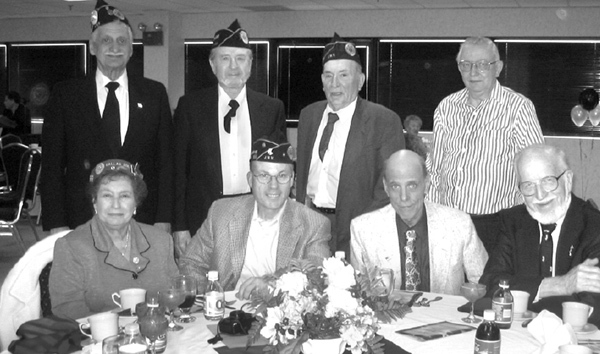 New Jersey Veterans Memorial Homes conducted their Annual Volunteer Appreciation Luncheons in April at Vineland on the 20th, Paramus the 24th and Menlo Park on the 28th (pictured above). The luncheons honor the veterans organizations and the role they play in the volunteer support to the homes. Photo courtesy New Jersey Veterans memorial Home at Menlo Park. The Department of Veterans Affairs (VA) has selected a 214-acre property near Dolington in southern Bucks County as the site for a new national cemetery 25 miles north of central Philadelphia. VA plans to begin burials in a small section of the cemetery as soon as late 2008. Information on VA burial benefits can be obtained from national cemetery offices, from a VA Web site at www.cem.va.gov or by calling VA regional offices tollfree at 1-800-827-1000. One of the most widely used veterans benefits in America reaches a major milestone May 13 when Secretary of Veterans Affairs R. James Nicholson will announce that an Operation Iraqi Freedom veteran from Texas is the recipient of the 18 millionth home loan guaranteed by the Department of Veterans Affairs (VA). Since 1944 when President Franklin Roosevelt signed the Servicemen’s Readjustment Act into law, the GI Bill, as it is popularly known, has secured more than $892 billion of financing for veterans’ and service members’ home loans. In fiscal year 2005 alone, VA guaranteed more than 165,000 loans for mortgages valued at more than $24.9 billion. VA-guaranteed home loans are made by banks and mortgage companies to veterans, service members and eligible reservists. With VA backing a portion of the loan, veterans can receive a competitive interest rate without a down payment, making it easier to buy a home. On Jan. 1, 2006, the VA loan guaranty limit for no-down payment loans was increased to $417,000. The previous ceiling was $359,650. Information about VA home loan benefits is available on the Web at www.homeloans. va.gov/ or by calling 1-800-827-1000. The burial locations of more than five million veterans for whom the Department of Veterans Affairs (VA) has provided grave markers are now available on the Internet. Online since April 2004, the nationwide gravesite locator (http://gravelocator.cem.va.gov) helps veterans’ families, former comrades-in-arms and others find the graves of veterans. VA recently added 1.9 million records for veterans buried primarily in private cemeteries to its database. The gravesite locator previously carried records on 3 million veterans buried in VA national cemeteries since the Civil War, and in state veterans cemeteries and Arlington National Cemetery. Information on VA burial benefits can be obtained from national cemetery offices, from a VA Web site at www.cem.va.gov or by calling VA regional offices tollfree at 1-800-827-1000. 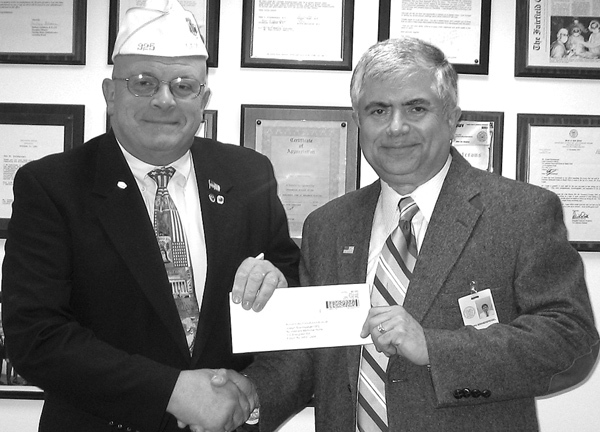 Joseph M. Gugliuzza (left), Department Commander, American Legion, presents a check for $7,500 to Joseph Brandspiegel (right) Chief Executive Officer, Veteran Memorial Home at Menlo Park, for the purchase of low beds. Troops and their families now have more financial security, thanks to the Department of Veterans Affairs’ (VA) new Servicemembers’ Group Life Insurance Traumatic Injury Protection (TSGLI) program. Prudential Financial Inc., the insurer, has began making payments under the program. The TSGLI payments, ranging from $25,000 to $100,000, are made to service members who have suffered certain traumatic injuries while on active duty. The new insurance program became effective December 1, 2005, and is designed to provide financial help to military families through extended periods of medical care and healing. Benefits are also payable retroactively to October 7, 2001 for service members and veterans who suffered certain traumatic injuries while serving in Operation Enduring Freedom or Operation Iraqi Freedom. For more information visit the VA’s website at www.insurance.va.gov or call the Servicemembers’ Group Life Insurance at 1-800-419-1473. The BG William C. Doyle Veterans Memorial Cemetery is working toward designation as a Certified Audubon Cooperative Sanctuary. They are looking for volunteers for outreach and education. The National Purple Heart Hall of Honor is scheduled to open on Nov. 11 at the New Windsor Cantonment State Historical Site located at Vails Gate, N.Y. Servicemembers who have received a Purple Heart and wish to be listed should send a copy of their DD-214 to the National Purple Heart Hall of Honor, P.O. Box 207, Vails Gate, NY, 12584. The Department of Veterans Affairs (VA) Medical Center (VAMC) in Wilmington, Del., has expanded its services to southern New Jersey. These services, which include emergency care and specialty services, are available to eligible veterans enrolled at the Wilmington VAMC. Veterans seeking these services must first obtain a referral from a Wilmington VA provider. Primary care services are offered at the Vineland and Ventnor Community Based Outpatient Clinics. Both are currently enrolling new veterans. For more information call 1- 800-461-8262, extension 5212. For authorization of services call 1-800-461-8262, extensions 4154 or 5217. On March 17, the New Jersey Advisory Committee for Women Veterans presented the Minutewoman Statue to the chief executive officers (CEO) of the New Jersey Veterans Memorial Homes. From left to right: Helen Brudner, Committee Member, Dorothy Dempsey, designer of the statue and former Committee Member, Joseph E. Romano, CEO, Vineland; Doris R. Neibart, CEO, Paramus; Joseph Brandspiegel, CEO, Menlo Park; and Anna Hoffman, Committee Chairperson. Photo by Kryn Westhoven, NJDMAVA/PA.